Vitaly (pictured) was abandoned at birth. With Down syndrome and a life-threatening heart condition, the Russian orphan's prospects looked bleak. Luck unexpectedly struck in October 2012, when an American couple visited him at his orphanage in Moscow. The couple, Jenny and Aaron Moyer, explained they wanted to become his parents and promised to come back for him soon. "He almost died once, before the adoption process started, so we were very happy to find parents for him," says Alyona Sinkevich, who worked for the U.S. adoption agency that put the Moyers in touch with Vitaly. Two years later, Vitaly, who is now 6, still lives in an orphanage. He is one of 259 Russian children whose pending adoption by American families was terminated when Russia abruptly barred U.S. citizens from taking in Russian orphans. The ban, signed by Russian President Vladimir Putin on December 28, 2012, left Vitaly with nothing more than a handful of family pictures and a broken promise. The Moyers have filed an appeal with the European Court of Human Rights. But the odds of their ever taking custody of Vitaly, whom they already consider their son, are extremely slim. The ban has sparked international outrage, with human rights advocates accusing Russian officials of sacrificing children for their political agenda. Sinkevich says children like Vitaly stand "almost no chance" in Russia, where most orphanages are woefully ill-equipped and staff often untrained to care for children with special needs. Vitaly was able to obtain a pacemaker only after the director of his first orphanage raised money from private donors. Boris Altshuler, a leading children's right advocate, says Moscow made a "terrible mistake" by introducing the so-called Dima Yakovlev law -- named after a Russian-born toddler who died in 2008 after his adoptive American father accidentally left him in an overheated car. "This law is absolutely horrific," says Altshuler, who heads the nongovernmental organization Children's Rights. "Our deputies and politicians couldn't care less about children." The ban was instituted in retaliation for a U.S. law that placed sanctions on Russian officials believed to be implicated in the prison death of Russian whistleblowing lawyer Sergei Magnitsky. The Russian government has encouraged its citizens to make up for the loss of U.S. adoptive families. But while authorities have touted a rise in the number of domestic adoptions, Russians are still reluctant to take on children with special needs. There are currently more than 600,000 orphans in Russia, every fourth a child with special needs or suffering from an illness. Until 2013, the United States had been the top destination for adopted Russian children. U.S. families have taken in more than 60,000 Russian orphans over the past two decades, many of them children with special needs. Rights activists are also concerned about the secrecy surrounding the fate of orphans whose adoption in the United States was cut short by the ban. Altshuler says he has almost no information on these children and suspects authorities of imposing a moratorium, effectively making discussion of the matter "taboo." Sinkevich herself has been unable to find out where Vitaly is currently institutionalized. "We fear for his life all the time, every day, because there were several occasions when his cardiostimulator stopped," she laments. The director of Vitaly's former orphanage, the one who helped buy his pacemaker, confirmed that Vitaly is alive and well but said she could not disclose his whereabouts. Sinkevich had been processing six adoptions by American families when Russia introduced the adoption ban. None of the six orphans made it to the United States. According to information she was able to glean from orphanages, four of these children were placed with Russian families -- a success she attributes to intense media coverage in the wake of the ban. 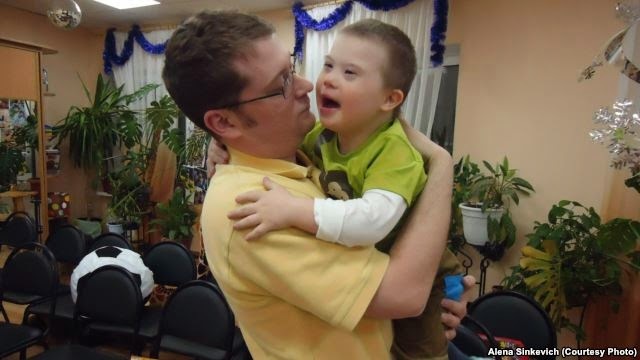 The sixth orphan, a toddler with Down syndrome called Dmitry, remains in an orphanage. At least one child, also with Down syndrome, is reported to have died after being denied adoption in the United States. That child, Daria, never met her prospective U.S. parents. The ban came even before they were able to visit her at her orphanage near the central Russian city of Nizhny Novgorod. Russia officials have categorically dismissed reports that Daria died last year of a heart ailment. Both volunteers and Daria's would-be American parents, however, have been cited as confirming her death. "Doctors did everything in their power; she underwent several serious heart surgeries," says Veronika Genkina, a journalist based in Nizhny Novgorod who was briefed by local officials about the case. "According to volunteers, her death took everyone by surprise. Dasha is buried in the village of Fedyakovo." The director of Daria's orphanage declined to comment on the case. Orphanage No. 13 in St. Petersburg is one of the rare institutions willing to share detailed information about children left behind by American families. Four of the city's 33 children whose U.S. adoption was derailed two years ago came from this orphanage, which is pioneering new methods allowing more bonding between children and their caretakers. Three of them have already been placed with new families in Russia. Yana, a girl with Down syndrome, was taken in by a Russian couple who had recently adopted another orphan with the same condition. Svetlana, who was just a few months old when the Dima Yakovlev law took effect, was also able to find a new home in Russia after undergoing a liver transplant. "Thanks to the fact that Sveta's story was made public, a Russian family came forward," says Maria Solodunova, a psychologist at the orphanage. "They adopted her after the operation and are now raising her alongside their own biological daughter." Timofei, another toddler with Down syndrome, has also found a home. Like Vitaly, he had already met with his prospective U.S. parents when the adoption ban struck. "He had photos of this family. He liked to display them for visitors. He was happy to show his new family," remembers Solodunova. "Unfortunately, the new law stripped this family of any possibility to take this child into their home." Footage of Timofei sadly leafing through the photographs of his American family was widely broadcast in Russia, where he was soon dubbed "The Boy With the Album." Solodunova says this helped Timofei draw "a lucky ticket." His biological parents eventually decided to take him back, while keeping in close touch with the U.S. family that had planned to adopt him. "This is a unique case when a child was able to find not just one family, but two," says Solodunova. Little Nikolas has not been as lucky. The 3-year-old suffers from epidermolysis bullosa, a severe skin disease that requires intense daily care. Young patients are also known as "butterfly children," in reference to the fragility of their skin. "We considered the family that decided to adopt Nikolas shortly before this law as his only chance," says Solodunova. "This family had friends who adopted a child with epidermolysis bullosa from a Moscow orphanage, so it was a very well-informed decision on their part. Unfortunately, it fell through." Nikolas remains at Orphanage No. 13. With the Kremlin showing no easing adoption rules for U.S. families, Nikolas, Vitaly, and thousands of other children face lifetime institutionalization in Russia. The Russian children's ombudsman, Pavel Astakhov, has actually urged the Kremlin to extend the ban to other countries. Known for his staunch support of Putin, Astakhov has described the international adoption of Russian orphans as a "semi-legal scheme of exporting children." "There's a Russian proverb that goes, 'The further away from the tsar, the safer your head,'" says children's rights activist Altshuler. "These toddlers, these disabled babies found themselves too close to the tsar, to big politics, and to the zeal of our deputies. They were so close that we will unlikely find out anything about them now."